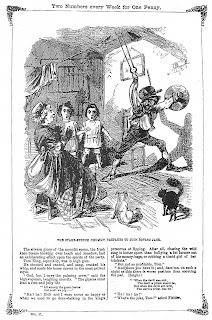 “Why,” said he, “one of the great delights of my boyhood was the work of Charles Keene, the English cartoonist. He was the master of a style of drawing that could never be improved upon. 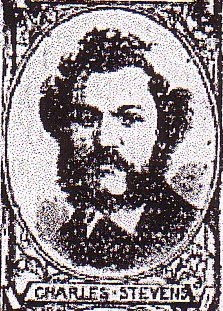 I admired him very much and owe a good deal to him in the way of inspiration.” - Frederick Burr Opper to London Daily Mail, 3 October 1903. 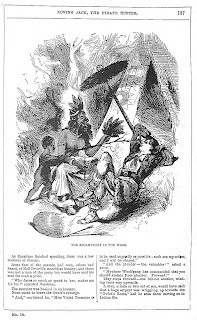 Above Charles Keene illustration from Punch. 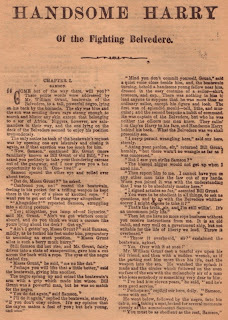 Gasoline Gus by O. P. Williams. 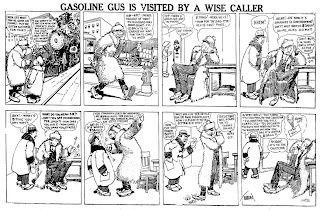 Gasoline Gus was the subject of two silent movies and a popular song which can be heard HERE. 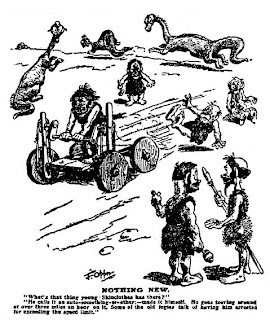 Harry Cornell Greening's "Percy Brains He Has Nix" from Nov 6 and October 26 1912, New York Herald. 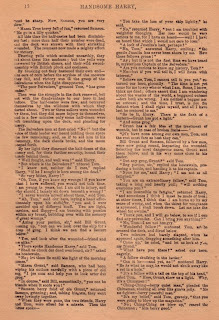 Steven Rowe has found that Greening was still alive in December 1941, when he was listed as one of his deceased brother's survivors. 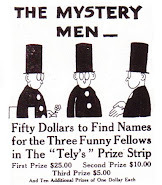 "Percy Brains He Has Nix"was the title of an animated cartoon from the early Bray Studios. 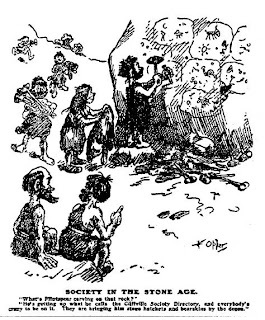 Harry Cornell Greening (1876-?) born in Titusville, Pennsylvania, on May 30, 1876. He left Titusville in 1884 to contribute to Puck, Judge and Life. 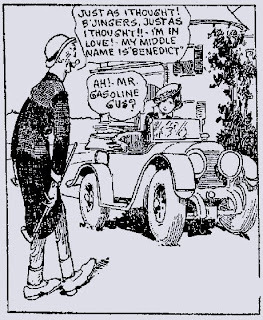 He was one of the early comic supplement men whose comic strips were syndicated by C. J. Hirt. Prince Errant, accompanied by his jester, roamed a fantasy world full of griffins, witches, and dragons, in search of a princess to wed. Usually he came to grief at the hands of the various princesses’ fathers. 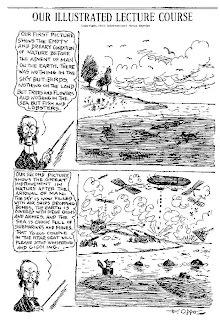 He was a masterful draftsman and one unique quality of the comic was that it was an adventure strip continued from week to week. 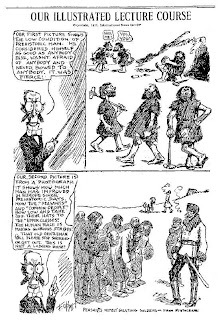 “Harry Cornell Greening, one of the pioneer comic strip artists, hasn’t lost faith in the world’s honesty. Barnacle Press has a nice selection of another Greening strip, The Woo Woo Bird, HERE. Time magazine mentions his creation Percy the Mechanical Man HERE. 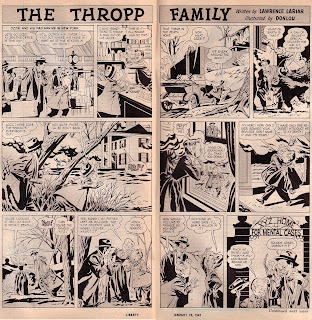 One more fine episode of The Thropp Family by Don Komisarow, Lou Fine and Lawrence Lariar from Liberty 18 January 1947. This issue also feature an article on Canadian animator Norman McClaren I posted HERE. 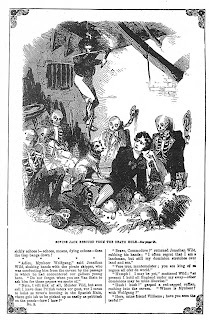 A look at one of the more disreputable publishing ventures of Charles Henry Ross, creator of Ally Sloper. 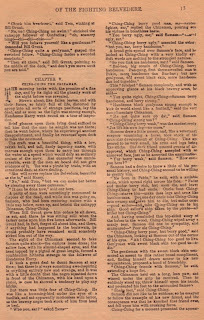 “The Editor” is Charles Dickens Junior and he lambastes both Mary Braddon and C. H. Ross for their chop jobs. The work referred to was “C. 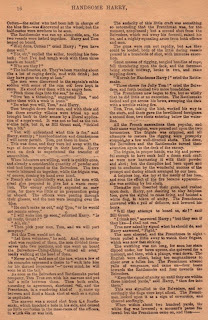 H. Ross’s Penny Library.” For one penny the buyer received the “cut and paste” version of popular works in 32 page pocket books. Titles included The Hunchback of Notre Dame, the Confessions of Harry Lorrequor, The Mysteries of Paris and “Newgate” by Charles Dickens. That Mrs. Braddon’s abridgement of Scott’s novels would be speedily followed by other mangled versions of popular books was only to be expected. 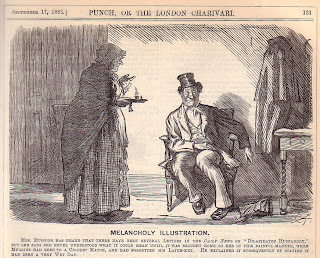 Charles Dickens, Charles Lever, Lord Lytton and Captain Marryat are to furnish materials for the next series, which is also to deal with Sir Walter, and for the production of which the scissors of Charles H. Ross have been called into requisition. 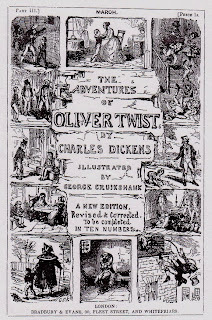 *Illustration from original 1846 Oliver Twist in Monthly parts. 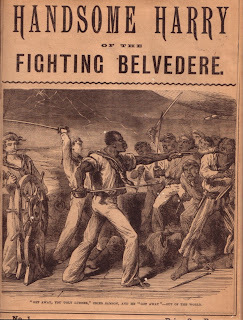 “Roving Jack the Pirate Hunter, a Romance of the Road and the Ocean,” by Charles Stevens, 40 nos. 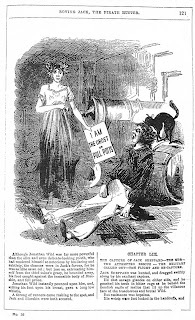 London: NPC, August 1862. 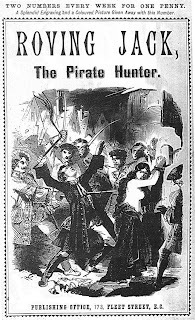 “Roving Jack the Pirate Hunter” “Boys of England Office” 40 parts.1882. 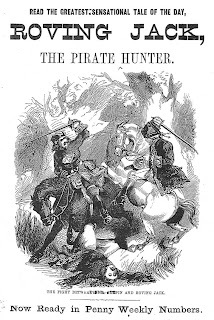 “Roving Jack, the Pirate Hunter.” Excerpts from; “Our Very Cheap Literature.” from The Contemporary Review, Volume XIV, 1870, by Alexander Strahan. Oh! the unutterable horror and despair of that awakening in the pit of death and darkness. The rude shock of his fall roused our hero from his state of insensibility. He lifted his head. He felt blinded, racked with agonizing pain, sick, giddy, faint, bewildered, half-suffocated with that awful stench of corruption. He was alone in the deep darkness, but where? He knew not; his mind was a glass darkened and shattered. He must shake off the wretched incubus that lies like a ton of lead upon his breast; he must awake - awake to the cheerful light; start from his hell-charmed slumber; break through the hag-spell that enthralls his soul with such dark and loathsome conceits. The boy uttered a wild cry; the echoes laughed like mocking demons. The hard steel clinked, and he found his wrists locked together, and his feet bound ! A twinge of exquisite pain shot through his aching head, and the veins of his brow seemed to swell to bursting. He felt a clammy, warm trickling down his face. It was a stream of blood! By slow and painful degrees he collected his thoughts, and recalled all the dread incidents of that eventful night. The savage face of the miscreant thief-taker seemed scowling upon him. The fancy nerved the fierce heart of the fiery young hero to a pitch of desperate anger. Jack gnashed his teeth with rage. Jack dried his eyes and rested his head against the cold, dank wall. He fixed his thoughts steadily upon holy things, and murmured a prayer. Jack turned over upon his side, and managed to writhe along for a yard or two. He stretched out his arms. He shook convulsively, and it was a long time before he could control his excited feelings. “Oh, for one ray of blessed light!” he cried fervently. Crawling about he laid his hands more than once on round hard skulls, and sharp fleshless bones. He uttered a fearful cry, his brow exuded a cold clammy sweat, his limbs quivered like reeds in the wind, his lips became parched, his hair roused, and he felt as if he were losing his senses. He threw himself down against the wall, and buried his face in his hands, crushed by despair and dismay. At last he roused himself from his stupor, and glared wildly around him. The stench grew more and more oppressive and the darkness was intense. All at once there arose from the floor at some distance from him a greenish lambent flame that flickered faintly, and threw a ghastly light upon the awful scene. Transfixed with awe, our hero glanced around. The place was a very charnel of dead bones. It lapped upon the floor, and in its fantastic waverings resembled the flare of ignited ether. At last it settled at the feet of a lank and hideously-grinning skeleton propped against the opposite wall. Then it spread about the dread relict of miserable humanity, and flared upwards in an unconsuming blaze, playing round the smooth bare skull and creeping into the hollow eye-sockets. Presently he was startled by a quick stealthy rustling. Tumbling and squeaking among the rattling bones, a legion of these detestable vermin surged around him. 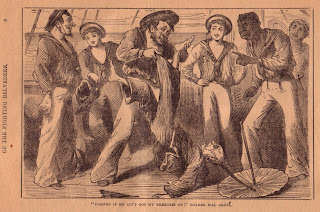 One darted right across his face, inflicting a sharp bite upon his cheek. Jack shrieked and staggered on to his feet, supporting himself against the wall. Goaded to a pitch of madness, he snatched up a skull, and sent it clattering along the ground. Squeak, squeak! and a terrific scampering. 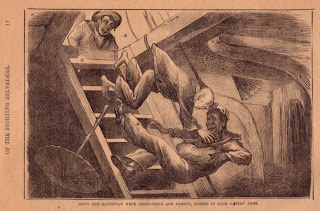 Jack hurled another skull, and another, and another, till he sank with exhaustion. His mind wandered, and he feebly muttered his incoherent prayers. Now, the darkness seems peopled with dusky, yet visible forms, shapeless, yet living; they surrounded him, and seemed to gloat over his dying agonies. “Ha, ha, ha, ha, ha-a!” the cavern resounds with demoniac laughter. “Ha, ha, ha, ha, ha-a !” roar the echoes. A mystic blue light dawns in the place. They rear themselves on their gaunt shanks, and clack their bony hands together. Now they whirl round him faster and faster and faster, till he becomes dizzy. One of them is taller than the rest, and seems to be their leader. He is mantled in a heavy, black velvet pall, fringed with light lawn. He pauses in the dance, and, approaching the captive, seems to proffer him assistance. 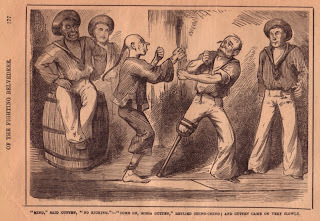 Jack holds out his chained wrists. The spectre touches them with the hard tip of his bony finger, and an electric thrill darts through the captive’s shrinking veins. The steel manacles are shattered, and clash to the ground like broken glass. Jack shouts in mad triumph, and then points to his scorching lips, and sues for drink. The spectre presents a skull into which he has poured some ruby liquid. 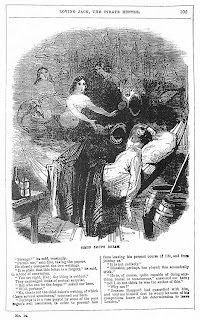 Jack takes a greedy draught. Then, with a horrible scream, he dashes the ghastly chalice to his feet. His face and hands are smeared - with blood. 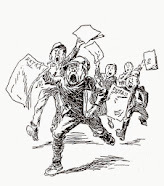 “Ha, ha, ha, ha, ha-a !” yell the death spectres, and away they go round again, whirling dizzily, dizzily, deftly, nimbly, tossing up their jointed limbs, and nodding their faceless heads. A delightful sensation of languid repose now overpowers the captive, and he stretches himself on the ground. But what strange spell is on him? Now there is a deep hush; the skeletons depart and he is left alone. After awhile they return and swathe the living corpse in the garments of the grave and place it upon the bier. The hollow echoes respond solemnly. The passing knell of the living dead! The bier is raised on the clacking shoulders of the ribbed spectres. The cavern rings with a grand organ peal - the dirge of the dead alive ! The funeral procession is formed; some of the grizzly skeletons march before, and they scatter fresh flowers that wither to dust ere they reach the ground. Others of the spectres follow. The black-mantled leader acts as chief mourner. Still the enchanted retains perfect consciousness. A dark grave yawns beneath him. He is lowered amid the hollow moanings of the skeleton mourners. Cooped in his narrow cell, still conscious, but dumb and impotent to stir a muscle, the living dead glares up at the black cloud that is descending upon him. 2. Daring Ching-Ching; or, the Mysterious Cruise of the Swallow 18 nos. 3. Wonderful Ching-Ching, His Further Adventures 30 nos. 5. Ching-Ching Yarns No. 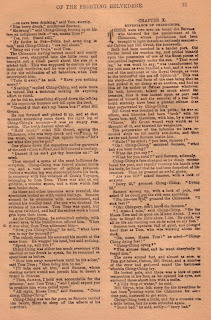 1, “Ching-Ching on the Trail.” Further tales in this pocket series were written by Burrage but were not Ching-Ching stories. 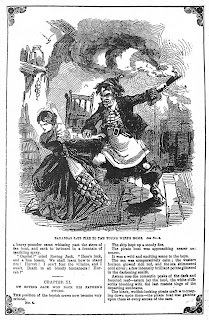 Thomas Frost (1821-1908) was the author of several penny bloods in the 1850’s including Paul the Poacher, The Black Mask; or, the Mysterious Robber, and George Barrington, the Gentleman Pickpocket. 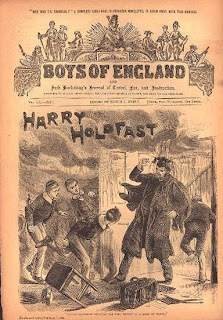 In the 1870’s he began writing boys’ serials for Edwin Brett on the Boys’ of England story paper. 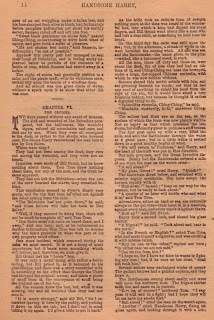 In the following excerpt from Frost’s Reminiscences of a Country Journalist (1886) he recalls an eccentric author who contributed to Boys’ of England during the same period. “There was another contributor to the Boys of England whose name I never heard, and am not sure that it was even known at the office. Before I had ever seen him, or heard anything concerning him, I was one day asked my opinion of a story which had been commenced two or three weeks previously, without the author’s name. James Bond was the first great anti-hero in popular culture and the godfather of numerous fictional assassins to come; like the Executioner and the Punisher. James Bond was amoral and misogynist; he lived outside the law, bedded every woman to cross his path and killed without compunction. Starting in 1954 Ian Fleming’s James Bond novels got good reviews and sold well in North America so it’s puzzling why it took until October 1962 to bring the first movie, Dr. No, to the big screen. The comic strip James Bond was produced for the Daily Express beginning with an adaptation of Casino Royale on 7 July 1958. 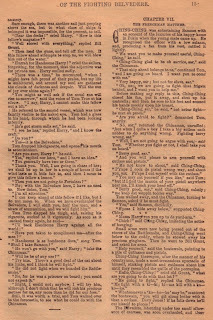 It was scripted by Anthony Hern and illustrated by John McClusky. James Bond made his debut in Canadian and American comic pages in 1960 with the adaptation of From Russia With Love, written by Henry Gammidge, and Dr. No penned by Peter O’Donnell. 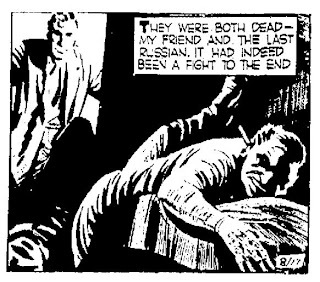 McLusky’s style was strongly influenced by Alex Raymond’s Rip Kirby. 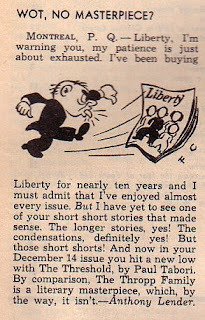 The comic strip ended on 8 January 1966. In film Dr. No was preceded by The Avengers in 1960, starring Patrick Macnee and Honor Blackman. Macnee’s most famous partner, however, was Diana Rigg as Miss Peel. Blackman later played the Bond girl in Goldfinger. 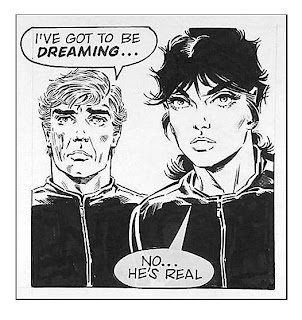 The comic strip Modesty Blaise first appeared in the London Evening Standard Monday 13 May 1963 and ended on writer Peter O’Donnell’s birthday 11 April 2001. Within 13 years of its conception the comic strip was syndicated in more than 40 European countries, Modesty Blaise was the heroine of a series of popular novels, and a movie was produced with the character played by Italian actress Monica Vitti. So far I have found no samples of the comic strip in North American newspapers. Peter O’Donnell came from a newspaper family and began his career working for the Amalgamated Press on children’s comics and story papers. 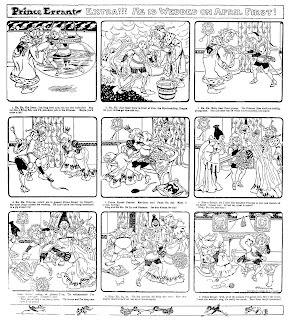 At that time Amalgamated published over twenty weekly comics. 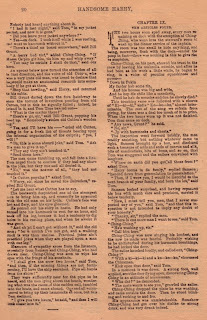 In the early sixties O’Donnell had moved on to newspapers and was forming the idea of Modesty Blaise, basing her adventures on his own wartime experiences in the Caucasus when he had noticed the struggles for survival of children as young as six or seven fleeing the advances of Hitler’s army. Modesty survived a war-time childhood and spent seven years as head of a criminal gang. In 1963 when the strip began our heroine was 26 years old, rich, retired and reformed, working for a mysterious branch of government along with her knife-throwing sidekick Willie Garvin. 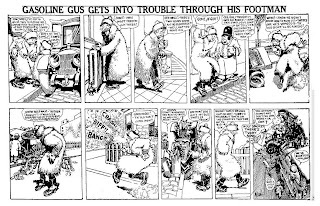 In 1976 O’Donnell, who regarded himself simply as a storyteller, was producing the comic strip from a small office over a wine bar on Fleet Street. He would work on the storyline, plot and dialogue before sending the script on to artist Badia Romero, who lived in Spain and knew no English. The previous artist had died in a car crash. Photos were taken of judo sessions, numbered, and sent to Spain where Romero would work up a drawing from a number supplied by O’Donnell to indicate the action wanted in a panel. 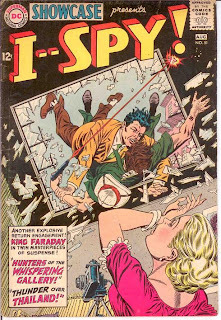 Spies had proliferated in comics during the forties but they mostly involved military spying during WWII and the Korean War, super-heroes like Fawcett’s Spysmasher, and Dirty Dozen groups like The Blackhawks. The American Comics Group published three spy titles. 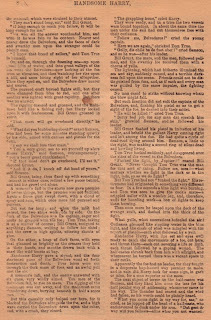 Spy-Hunters of 1948 had an emphasis on Uranium and communism around the globe and the main character of Jonathan Kent, Espionage Ace. In 1949 the title was changed to Spy and Counterspy continuing the adventures of Jonathan Kent Counterspy from the previous title. Stories took place in exotic Korea, Prague, Greece and Berlin. 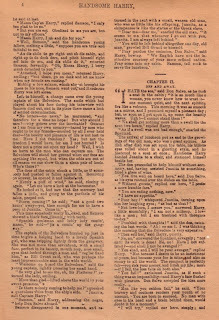 Each issue contained one historical spy story featuring real-life spies like Mata Hari. In 1954 ACG released Commander Battle and the Atomic Sub which merged science-fiction and the Cold War in a series very like DC’s Challengers of the Unknown and Doom Patrol. It lasted 8 issues. John Force Magic Agent, No. 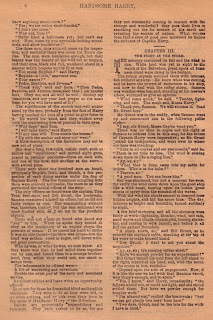 1, was published in 1962 by ACG. He was a member of the top secret American Security Group, wore an eye-patch, had a magical coin that allowed him to produce illusions, read thoughts and implant hypnotic suggestions in the minds of his (mostly) Commie enemies. Magic Agent, scripted by John Hughes and illustrated by Paul Reinman, lasted a mere 3 issues. In August 1964 at the height of the mod spy craze DC comics published I-Spy in Showcase no. 51. These were reprints of the King Faraday stories from 1950’s Danger Trail created by Robert Kanigher and Carmine Infantino, with stories taking place in Paris and Istanbul aboard the Orient Express. The mood was serious and the artwork expressive. The television show The Man From U.N.C.L.E. began on 22 September 1964 and ran through 1968. The name Napoleon Solo was suggested by Ian Fleming himself. 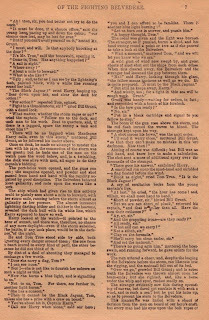 Gold Key published The Man From U.N.C.L.E. comic books. By 1965 spies proliferated on television and the movies. Amos Burke Secret Agent was shot in black and white which made it easy to be knocked out in the ratings by Robert Culp and Bill Cosby’s salt and pepper team on I Spy, which was shot in color with footage filmed in Hong Kong, Mexico, Japan and Europe. 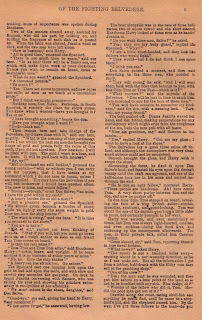 Gold Key published 6 issues of I Spy from August 1966 to September 1968. The Wild Wild West made its debut a few days after I Spy, merging spy and western genres. At the same time Mel Brooks created Get Smart, a spy sitcom featuring Don Adams in the starring role. 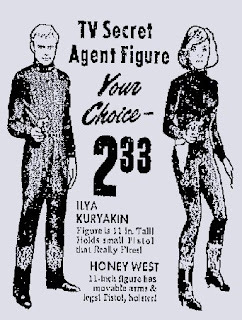 Honey West was a detective series but borrowed heavily from the martial arts popularized in The Avengers and the Bond movies. Mission Impossible began in 1966 and ran until 1973. 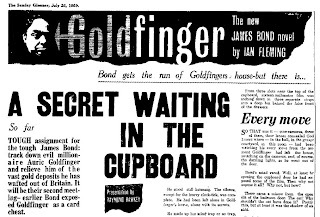 Goldfinger premiered 25 December 1964 and in early 65 The Ipcress Files, the first in a trip of movies starring Michael Caine as reluctant spy Harry Palmer began. The serious adaptation of The Spy Who Came in From the Cold premiered in late 65 with Richard Burton. Two tongue-in-cheek spy-spoofs, Our Man Flint (1966) and In Like Flint (1967) starred James Coburn as superspy Derek Flint. His boss was played by Lee J. Cobb. Dean Martin starred in The Silencers, first of four Matt Helm movies, in 1966 and in Britain Patrick McGoohan began Secret Agent Man, leading to a hit single for the tune of the same name sung by Johnny Rivers. The public’s interest in spies began to wane at the end of 1966 and by the time of In Her Majesty’s Secret Service, the George Lazenby vehicle, in 1969 the massive popularity of the spy genre was over. There was however one other strand grafted onto the spy genre, dating back to the forties with Charles Biro’s Daredevil’s Little Wise Guys (1942), and Simon & Kirby’s Young Allies, The Boy Commandos and The Newsboy Legion (all 1942). By the sixties these types of tales had been co-opted by movie makers for The Dirty Dozen (1967), and by Marvel comics with Sgt. Fury and his Howlin’ Commandos (1963) which popularized the misfit groups of all nationalities each with their own handy wartime specialty. 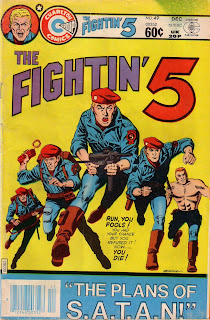 Charlton responded with The Fightin’ 5 in 1964 featuring a modern group proficient in karate, boxing, judo, wrestling and the use of jet-propelled backpacks to attack the enemies of America. After the war Sgt. Fury, of course, became Nick Fury Agent of S.H.I.E.L.D in 1965.